"Gooseflower, Shrewfur, Stoneflight!" cheered Fishtail for the pride's newest warriors. Coyotefeather dragged the body of Whisperstar out of her den, placing the leader in the center of the pride camp so the pride could grieve. Willowdaisy padded over and pressed her nose deep into Whisperstar's fur. Torneye pressed his nose into Whisperstar's fur, then tossed his head back in a roar. "Lions of FlamePride. Listen, And I will appoint my deputy. I say these words before StarPride so our ancestors may hear and approve my choice...Willowdaisy will be the deputy of FlamePride!" "Thank you, Tornstar." answered Willowdaisy as she dipped her head to her brother. "Tornstar, Willowdaisy! Tornstar, Willowdaisy!" cheered Brightcub from his seat outside the nursery. Emberleaf padded past her pridemates and into the nursery, squeezing inside carefully. Once inside, she dipped her head to the other queen and settled down into an empty nest. 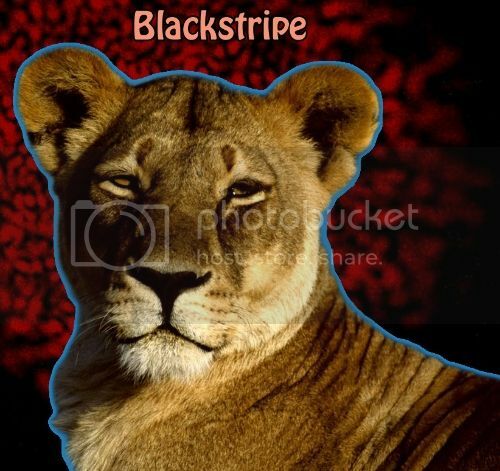 Blackstripe padded into the FlamePride camp, carrying a baboon in her jaws. She made her way into the nursery, dropping the baboon at the queen's paws with a dip of her head. Emberleaf's chest rumbled as she licked the five cubs at her side. As she touched her nose to each cub, she whispered their names into their tiny ears. Coyotefeather padded into the FlamePride camp, carrying a poppy head in her jaws. She made her way into the den, placing the poppy head into the storage. Clovestripe made her way into the FlamePride camp, carrying feathers in her jaws. She padded into the warrior's den, placing the feathers in her nest. Brambleflower made her way into the FlamePride camp, carrying a baboon in her jaws. She padded over to the fresh-kill pile, dropping the baboon on top. Mosscub pricked up his ears and padded out of the nursery to hear what Tornstar had to say. "I, Tornstar, Leader of FlamePride, call upon my warrior ancestors to look down on this apprentice. He has trained hard to understand the ways of your noble code, and I commend him to you as a warrior in his turn. Volepaw, do you promise to uphold the warrior code and to protect and defend your pride, even at the cost of your life?" "Then by StarPride, I give you your warrior name. Volepaw, from this day on, you will be known as Volerabbit. StarPride honors you and we welcome you as a full warrior of FlamePride." Padding forward, Tornstar rested his muzzle on top of Volerabbit's head. Volerabbit licked Tornstar's shoulder, then sat back and listened to the pride call out his new name. "Volerabbit, Volerabbit, Volerabbit!" cheered Snowtail for the pride's newest warrior. Coyotefeather padded into the FlamePride camp, carrying catmint in her jaws. She made her way into the den, sitting down to sort out the catmint. Clovestripe padded into the FlamePride camp, carrying a chimp in her jaws. She made her way into the elder's den, dropping the chimp at the elder's paws with a dip of her head. "I, Tornstar, Leader of FlamePride, call upon my warrior ancestors to look down on these apprentices. They have trained hard to understand the ways of your noble code, and I commend them to you as warriors in their turn. Webpaw, Echopaw, do you promise to uphold the warrior code and to protect and defend your pride, even at the cost of your life?" "I do!" answered Echopaw loudly.